Once a new tenant completes the Application Process, they will receive access to the Bauer Properties online calendar. In addition to calendar access, they will be issued a single key that will open the back door and each of shared office suites. At startup tenants are asked to test their keys and test their access to the online calendar. Tenants should complete this prior to their first appointment. Once the tenants receive both the keys and access, they may now start booking their appointments. If a new tenant requested a Fixed Daily or Evening rental in the setup process, they will have defined a specific day, time and office they desired to rent. For example, they may reserve & book Suite C every Friday from 3:00 pm – 5:00 pm or Suite B every Tuesday from 2:00 pm – 10:00 pm, and so on. For Fixed Daily or Evening rentals, the Bauer Properties staff will book and reserve the appointments for the new tenant. Once booked, tenants can logon to the online calendar and view a complete list of all their scheduled appointments. Prior to the first of the month payment for the reserved offices will be due. Depending on the tenant’s lease one of these two options will be requested: the staff will send a monthly PayPal invoice requesting payment or the tenant will be asked to deposit a check into the mailbox located next to the backdoor. If tenants need to book additional appointments on different days then their Fixed Daily or Evening slot, they can use the calendar to add additional appointments. Some tenants at Bauer Properties elect the Flexible Option. They book appointments as needed. Some tenants book their appointments as they need the offices. Others book all their needed appointments at the first of the month. While others book at the first of the week. Some tenants book the same room all the time and some tenants book different rooms for different clients. It is flexible so tenants’ book as they like. 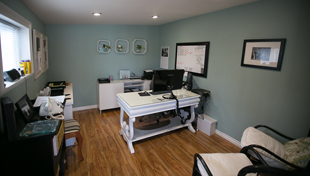 When tenants are ready to book their appointments, they should have an idea of the time and office suite they desire. Currently, we have 4 office suites available to choose from – Suite B, Suite C, Suite D and Suite E. Suites B-E rent at an hourly rate of $10.00 per with a two-hour minimum. Tenants will then go to the BauerProperties.com website, select "More Info" then "Online Appointment Calendar" and book an appointment in the office suite they desire. Payments is due at the time the appointment is made. Bauer Properties uses PayPal for payment, which has evolved over the years to accept all payment types and options. While using the office, tenants have access to the parking lot, kitchen and handicap bathrooms. In the lot there are 4 parking spaces and 1 handicap parking space. Tenants can either chose to park on the street so their clients have priority, or they can park in the lot. When the tenant arrives for their scheduled appointment, they unlock the building if it is not already unlocked. They turn on the lights for the lobby, hallway, kitchen and adjust the air conditioning or heating as needed. They obtain their door plaque from the mail slot area and check to see if they received any mail. They then place the door plaque in the door of the office suite they have scheduled. This will allow their clients to easily find their office. They then place the noise cancelling machine in the hallway as desired and unlock the front door if desired. When a tenant is the only one in building, it is at their discretion on how the doors will be opened. Some tenants open the front and back doors, allowing their clients easy access to the building. Others leave the front door unlocked and back door locked. Others may prefer all the doors locked and when their client arrives, they give them entrance to the building. Again, it is at the tenant’s discretion when they are the only tenant using the facility. When they are not the only one in the building the common policy is to leave the doors unlocked. There are security lights and surveillance camera in use and the neighborhood has been found to be very secure. It should be noted, if a tenant or their clients ever feel unsafe they may lock the doors as needed. Once the tenant’s appointments are complete, the tenant will straighten the office they used and return the noise machine to the room. They will check to see if they are the only one in the building. If so, they will turn off all lights, return the air conditioner or heating (if changed) to an energy saving level, then lock the front door and then exit through the back door. If they are not the only one in the building, they are not required to lock the doors. Tenants who have selected the Fixed, Daily or Evening Office Rental will pay monthly in one of two ways. They will place a check in the mail slot located next to the back door or they will receive a PayPal invoice around the 24th of the month. Tenants who have selected the Flexible Office Rental option will pay as they book appointments. If Flexible Office Rental tenants do not book the minium 8 hours in a one month period, they will be billed an additional monthly maintenance fee. They will receive a PayPal invoice between the 1st-10th of the month following month. This is due and payable upon receipt and considered late if not paid within 5 days. Bauer Properties tries to make things flexible and easily. The staff is 10 minutes from the facility so if tenants have any issues we are available to stop by. If not, we are available by phone at 714-639-8695 which sends a translated text and email to our staff. If you would like a return phone call, feel free to let us know. We try our best to be available so feel free to email or call. If at any time you would like to inform us of an issue, or a friendly suggestion feel free to contact us. We have always enjoyed working at Bauer Properties and hope you find it enjoyable as well.